As I sat down to write this post, I watched my cursor blink repeatedly for quite some time. I don’t take this privilege lightly of getting to speak into your lives as parents and as such, I pray over and, ultimately, choose my words carefully. You see, one of my biggest pet peeves is coming onto a website or blog, only to discover yet another way I’m not living up to my potential as a parent. Although I jumped at the chance to write about hearing God’s voice and when God asks us to do crazy things, putting words on paper about the topic has challenged me. Because for years when I would hear people say, “God told me to…” or “God spoke to me…”, it made me feel insufficient as a Christian. Is that even a thing – an insufficient Christian? To me, it was my reality. Coming to faith later in life, I felt like I had a lot of catching up to do. I didn’t know “how” to do a lot of things I read about in the Bible: pray, talk about Jesus, and most of all, hear God’s voice. So I would be ignorant to think I could write an article about when God asks us to do crazy things without thinking some of you were turned off by the title alone. Perhaps you, like me before, even experienced feelings of shame and insufficiency. But believe me, that is not my intent at all. Just as I’ve been challenged in finding the right words to share with you, I believe that is what hearing God’s voice is all about: challenging us to step beyond what we humanly believe is possible, both in hearing and obedience. 2. Make quiet space for him to answer. While the stories we read about in the Bible often talk about the Lord appearing in a dream or vision (or even his voice coming from a flaming bush), they don’t typically talk about what preceded those events or what was going on in the people’s lives before they heard God speak to them. Now, almost two decades after fully accepting Jesus as my Lord and Savior (not just saying I believed in order to avoid an unpleasant death), I can honestly say I’ve heard God’s voice on multiple occasions. Not an audible voice per se, but distinct words in my head that I could never have put together on my own. But more commonly, I believe I hear God speak to me when I ask him questions and then wait for a feeling in my heart or a response in my mind. Sometimes it’s as simple as feeling a lightness wash over me or a sinking feeling in my gut. Other times, I’ll have responses immediately come to mind. I don’t. I just trust. If I hear something, I’ll re-state it, asking if that’s what God wanted me to hear. Sometimes I’ll write it down and ponder it. Other times I’ll ask a follow-up question. Now, when it comes to talking to our kids about hearing God’s voice, that’s another story. In some ways, it can be easier because of their child-like faith. 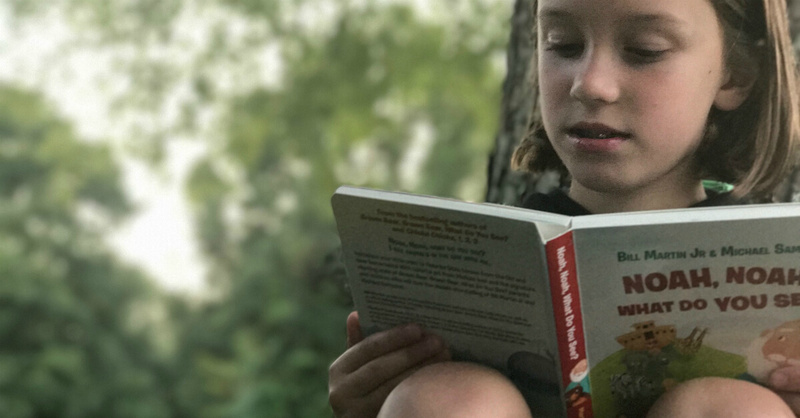 Yet at other times, trying to explain the surreal experience of hearing God’s voice to our little ones can seem daunting. One way I’ve ‘normalized’ talking to God is by having my kids ask God ‘simple’ questions before they go to bed (such as, “Jesus, do you love me?”), waiting for twenty seconds, and then asking what they heard, saw or felt. (Remember, just as we all learn differently, we ‘hear’ God’s voice differently – my son will hear things where my daughter will see images). But for the smallest children, trying to describe what happens when God speaks to us can be even more challenging. For this task, I love relying on simple, yet powerful, stories from the Bible. And don’t worry about getting bogged down with details; just highlight the characters and the truth. 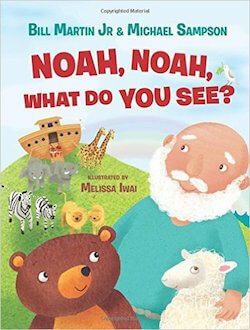 A new book I absolutely LOVE that will aid you in this effort is Noah, Noah, What Do You See?. And if that cadence sounds familiar…it is. This new treasure comes from the bestselling authors of Brown Bear, Brown Bear, What Do You See? and Chicka Chicka, 1, 2, 3. While not every story of God instructing his people involved his audible voice, they would not have known to do what they did had they not been listening for him (and in some cases, his angels). So whether you’re looking for a way to teach your young ones how to hear God’s voice, or you’re struggling with actually obeying his voice yourself, just trust, obey and remind yourself of all the stories of faith that have come before you. 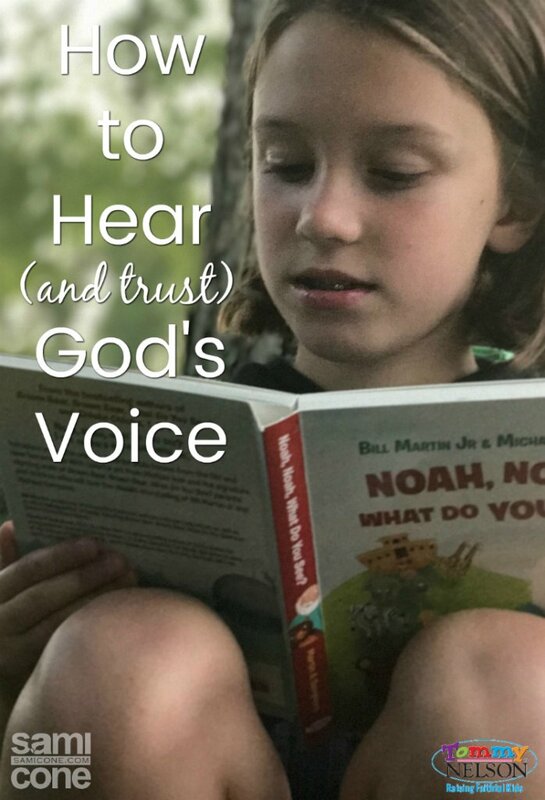 How are you (and your kids) learning to hear and trust God’s voice? This entry was posted in Blog, Tommy Nelson and tagged Hearing God's Voice, Noah, Noah Noah What Do You See, Parenting, Prayer, Preschool by Sami Cone. Bookmark the permalink.